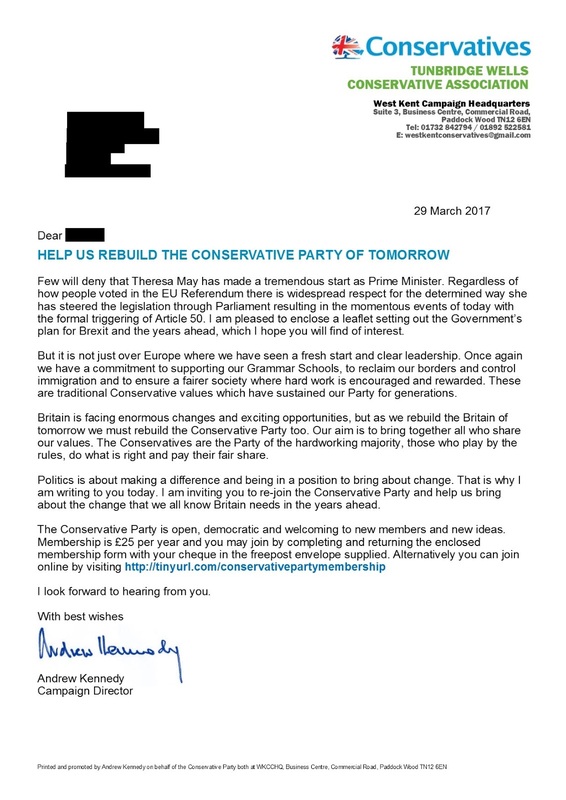 In today's post just over 1,800 former members, who stopped paying their membership during the Major -to Cameron years and who are still on the current electoral roll, will have received this letter from me inviting them to "come home and help us re-build the Conservative Party of tomorrow." It was sent with a copy of the excellent CCHQ Brexit leaflet and of course a membership form and a reply-paid envelope. At 12.30pm and under the watchful gaze of Maggie, the West Kent team toast events in Brussels and wish the Prime Minister every success in her negotiations to secure the future of our independent country. But five pages of rules and procedures about how we select our council candidates are of little use if the incumbent is automatically reselected as there is no-one else, or if the pool in which we fish for talent is so shallow that all we can catch is grey mullet. And regrettably as Associations stumble on with little training and support, apart from access to printed “Best Practice” guides, so the soft skills required to identify and develop not just potential council candidates but the leaders of tomorrow, continue to wither on the vine. Just over two years ago I recruited 100 volunteers to each hand address 1,000 envelopes as part of our General Election GOTV campaign. A chap in his mid-20s turned up to collect supplies for his mother, who had offered to help. As with every new face I engaged him in conversation. He was also a Party member and had been for ten years, but until that day the only contact he had with is local Association was three letters a year. One asking him to pay his subscription, another asking him to buy summer draw tickets and the third to buy Christmas draw tickets. In ten years he had not been contacted, not been asked to help, not been invited to a social or political event and not been welcomed. The happy ending to this story is last year he was one of our hardest working council candidates and this year he became Association Chairman, part of a new and young Officer team trying to turn around a somewhat moribund and inward looking Association. Whether it is for a branch fundraiser, a campaign session or to identify volunteers, I have lost count of the times I have heard “well, I sent everyone an email and very few responded.” That is the trouble with email. They are fast, they are easy and they are transient. If you have ever said to yourself, “Oh, another email asking me to buy a “Theresa May tea towel made for everyone” there is no reason to believe your equally time-restricted members won’t do the same when your email pings into their inbox, “Oh, another email from that woman asking me to be a candidate” before firmly hitting the delete button. Last year in Tonbridge we faced a difficult by-election in a ward which had been solidly Labour for over 60 years. We narrowly won it in 2007 after recruiting a local community activist as candidate, and even then only at her third attempt. Following her death the expectation was that without her name on the ballot paper the seat would almost certainly revert to Labour. Having exhausted our database in previous years I knew there was not an obvious candidate amongst our older members, so I trawled through the many new members who joined post referendum, and this included looking at what was publicly available about them on their social media profiles. One potential candidate lived in the ward and ran the local youth football team. The other was born and bred in the ward, educated at the local school, her grandfather chaired the local community centre and she had run campaigns using local bands to dissuade teenagers from drug and substance abuse. I arranged to meet them both for coffee and to explain the work of a local councillor; and both agreed to put their names forward. Fortunately the man had just become a father so wanted to wait until 2019, but the woman was subsequently selected and was the perfect by-election candidate, well known on the doorsteps, respected for her community work and hugely popular. We held the seat with 62% of the vote on one of the biggest swings to the Conservatives last year. What is interesting about the above case is both candidates had received emails from us asking if they would like to be a candidate, and neither had replied. In fact, when I asked them, neither recalled ever having received the email. Another example of why personal contact is vital when it comes to identifying and nurturing future talent. Across the six constituencies of the West Kent Group we cover four district councils and overlap with three more. In a full electoral cycle we need to find 328 local government candidates. Identifying and training so many candidates is a major part of my work, but I also try to ensure we have an available pool of talent so branches have options and do not have to “settle” for Hobson’s Choice. For example, this year over half of our county council divisions had contested selections. All but two incumbents were reselected, but the process highlighted the fact that the post was not a sinecure, and having to explain their record an set-out their campaign plans was helpful in focussing minds on the task ahead. And even our MPs will sometimes put a paragraph about the importance of good people putting themselves forward for local government and directing those interested to their respective political organisations. Throughout the year all potential candidates are logged and nurtured, and about two months before the selection process starts they are invited to an open evening with other potential candidates. They hear from one of our council leaders about the work of local government, and then from me about what will be expected of them in terms of campaigning and political involvement. I think it is important that all applicants are fully aware that they will not only be expected to campaign but also support the political and social life of their Association. Finally, over wine and food they have a one-to-one session with an incumbent councillor about their work in the community. This councillor will go on to be their mentor if they proceed with the application. Overall about 25% of people who express an interest end up being interviewed and selected, and many go on to be outstanding campaigners and councillors. Too often I fear we take the line of least resistance because that is easier than the alternative. I believe we owe it to our members, our supporters but most importantly our communities to do better. As part of the Westminster Foundation for Democracy's outreach programme, West Kent Towers were hosts today for the centre-tight Lebanese Forces political party, who were visiting the UK to learn about UK Parliamentary Democracy, grassroots campaigning and building an inclusive and open voluntary party. This is the second time we have hosted overseas visitors, having entertained 12 members of our sister-party from Ecuador in November last year. Today, it was particularly gratifying to hear the visit organiser say that West Kent was probably the best grassroots political campaigning organisations in the UK. High praise indeed. After looking around our palatial offices (both rooms) Jon and I presented on our work, including how we recruit members and helpers, fundraising, campaigning and identifying and training candidates and activists. This was followed by a traditional British Pub Lunch in one of our nearby villages and then two hours of street campaigning in Tonbridge. 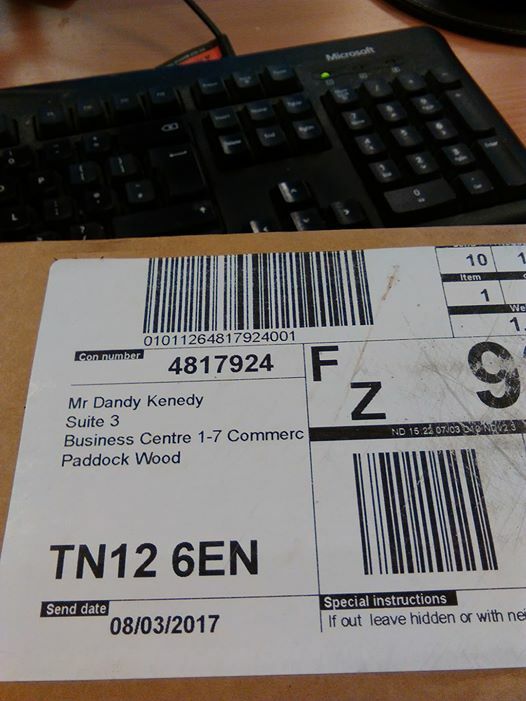 Great amusement and slightly too much raucous laughter from the office volunteers when an delivery driver turned up a few moments ago at West Kent Towers and announced "Delivery for Dandy Kennedy!" Turned out to be a bottle of Berry Bros Champagne, so I will forgive the sender. I am told "the person who took the telephone order must have misheard me....."
I now have an office-full of volunteers calling me DANDY. An amusement which will (very) soon wear thin! 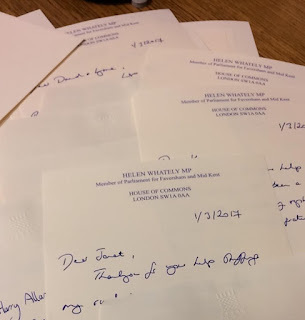 A few weeks ago Faversham and Mid Kent MP Helen Whately sent-out a survey to 6,000 rural voters. Rather than use paid staff to pack them, I offered our team of regular volunteers at West Kent Towers, saving time and taxpayer's money in doing so. Over twenty volunteers worked in shifts and got the job done in a day. 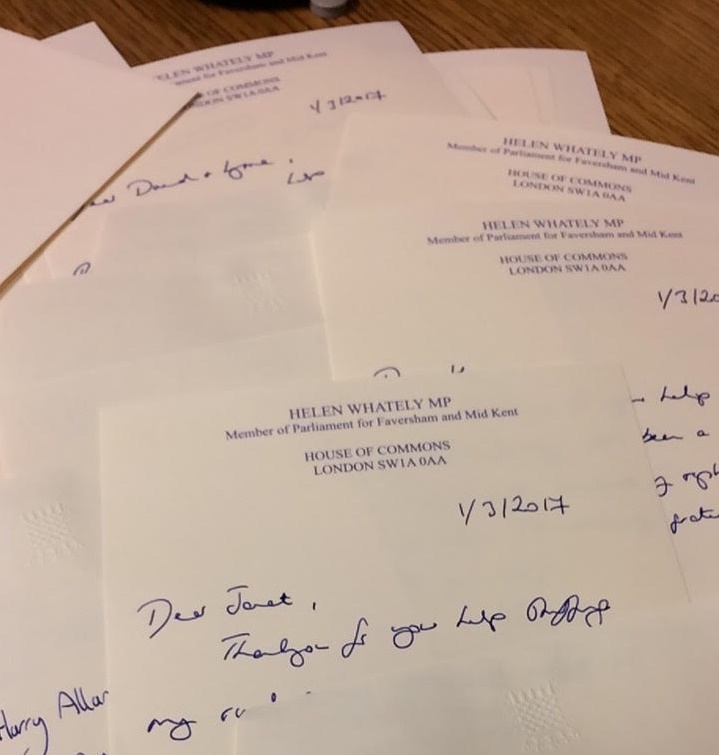 A few days later, without any prompting from me, each of the volunteers who gave up their time to help received a personal hand-written 'thank you' note; a generous gesture and one which was greatly appreciated by the team (particularly those who came from outside Helen's constituency to help). To reserve your place(s) at this event, please use the payment button below. We are in the process of delivering 100,000 surveys to target voters across our six West Kent constituencies, all printed, mail merged and packed in house. Anyone who has asked 100,000 people for their views will have an inkling of what we are going through. On Monday our post did not arrive; when Cllr Paperclips complained he was told "we know - you have so much we are sending it in a van." It took two volunteers almost four hours just to open the envelopes! As our teams data-capture the surveys in relays, candidates go straight to the "issues box" to see what people are thinking. I go straight to the VI to see how they will vote. Agents are from Mars / Candidates are from Venus! Today however we found a real delight. Stapled onto a survey was this note from a resident of Maidstone. They don't make them like this any more (more's the pity). In the weeks that followed the EU referendum, somewhere over 50,000 new members joined the Conservative Party. The surge took us all by surprise. Over 600 of those new members lived in West Kent, taking membership of our five local Associations back to the levels last seen a generation ago. Over the weeks that followed a not insignificant number let it be known that their primary motivation was to vote in the leadership election, which of course was not possible due do our longstanding “three month rule”. The numbers complaining about this led CCHQ to place a notice explaining the requirement on the online membership page and I understand that many refunds were issued. Personally, the fact so many had joined without any previous interest or involvement simply to try and influence the leadership election is total justification for having the rule in place and I hope we continue enforce it in the future. In our own survey, I gave new members a number of multiple choice options covering the areas that motivated them to join. When asked to rank these reasons, 75% (by far the highest number) chose “I joined the Conservative Party to vote in the leadership election” compared with just 8.4% who said this issue was not an important factor for them. And later-on I asked more bluntly, “If you had been aware at the time of joining that members were only allowed to vote after three months’ membership, would you still have joined the Conservative Party?” to which over 25% replied “no”. Over the last nine months these figures have weighed heavily on my mind, and from the many questions I have been asked by some senior figures at CCHQ and around the country I suspect I am not alone. I have never had much doubt that the 25% who said they would never have joined had they known they would not have had a chance to vote would not pay again, but what of the larger number (ie, the 75% who said the leadership vote was an important factor for them). This figure obviously includes the angry 25%, but what of the other 50%? Have we done enough (locally and nationally) to win their hearts and minds and keep them on board? It is now coming up to nine months since the first signs of the surge and many of the members who joined early on will soon be receiving invitations to renew their membership. To test the water and to see if I could identify how our new members feel we have performed locally (in terms of meeting their expectations and keeping them informed and involved) we ran a similar survey again, the findings of which are published below. However, there is a word of caution. Our original survey attracted a 50% response rate, sufficiently high to make it significant and probably representative. This time the response rate was just below 25% - and it is highly likely that the subsequent null responders are those who have lost interest and decided to walk away. The figures below are likely to be biased and the true situation might be somewhat worse. To the best of your memory, what was the primary reason for you joining the Conservative Party in June/July last year? Please tick as many as apply. Given I was asking people to remember what motivated them to do something nine months ago, I think the above findings are remarkably similar, the only statistic of note perhaps being the fall in the number of respondents identifying as Remain, which could indicate some of this group may well have disengaged, which was a likely outcome given the determined and unequivocal approach being taken by the Prime Minister over Brexit. Always conscious that Associations are often held responsible for not engaging or contacting new members, I was keen to ascertain how they felt we had engaged with them on a local rather than national level. 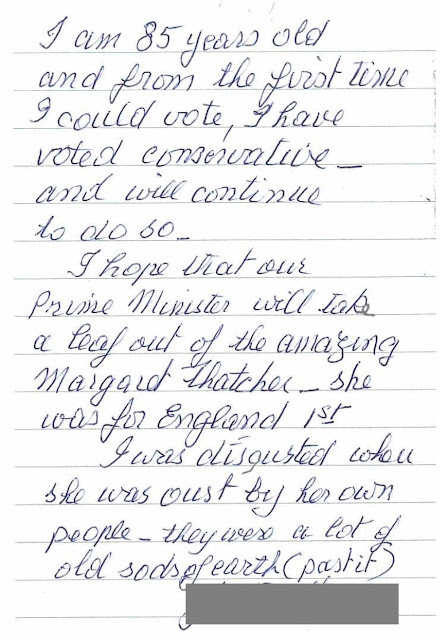 After you had joined the Conservative Party did you receive a letter of welcome from your local Association? And did you then receive a personal visit or telephone call from a local organiser to introduce themselves and talk through local events and activities? And how long did you have to wait for a letter or personal contact? Did you receive an invitation to meet your local association Officers and Member of Parliament at a “free to attend” drinks reception or similar, and if so, did you attend that event? So far, so good. Despite processing 600 new membership applications, 98% received a local letter of welcome and 82% received a personal visit or contact by telephone within a few weeks of them joining. The majority of our new members also recall being invited to a complimentary welcome event, though only 14% of them attended. Next I was keen to find out about how we communicated with them and had we met their expectations. Since you joined you should have received regular communication from us on a wide variety of issues. Please indicate below if you feel the frequency of emails on each of the following matters has been too little, about right or too much. At least they are hearing from us, and on most issues we have got it “about right” though the cynic in me would say our new members seem much more enthusiastic about attending policy discussions than ensuring we are in a position to implement those policies by campaigning and winning elections! And finally, the million-dollar question. As I wrote at the start of this article, the above is likely to present a rosy view of reality as respondents will be drawn disproportionately from those who are still engaged and willing to respond. I am however confident that in West Kent our new members have been contacted, welcomed and made to feel wanted, needed and loved.